Hopefully you're all prepped for your Super Bowl party by now, with all the ingredients for Carolina barbecued pork-and-bacon meatballs in the fridge. But if you're a die-hard Panthers fan, why not go all out? Shrimp & grits hushpuppies are a combination of two of the South's most highly regarded dishes. It doesn't get more Southern than this, especially when paired with the meatballs. In a large mixing bowl, whisk together flour, cornmeal, baking powder, sugar, baking soda, salt, and cayenne. Add onion, buttermilk, and eggs; mix until blended. Stir in shrimp and cheese until just combined. Pour oil to a depth of 2 inches in a deep fryer or heavy pot over medium-high heat until a deep-fry thermometer reads 375°F. Using a tablespoon, drop small rounds of batter into the oil, making sure to not crowd the pan. 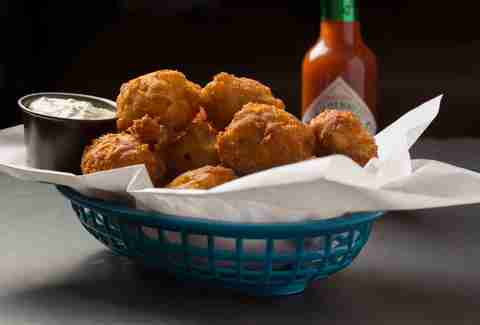 Dip the spoon in a glass of water after each hushpuppy is dropped in the oil. Cook, stirring occasionally, until golden, about 3-4 minutes. Remove hushpuppies from the oil and drain on paper towels. Serve with tartar and hot sauce.